Britain's industrial revolution in the 19th Century went hand in hand with the popularisation of science. Where, a century earlier, a knowledge of classical antiquity had been the mark of a "gentleman," increasingly an "educated" man or woman was expected to keep abreast of the latest developments in chemistry, physics and biology. London's Royal Institution, founded in 1799, offered public lectures by some of the leading scientific figures of the day. It was here that Sir Humphrey Davy inspired the young Mary Shelley with a lecture on galvanism; and Michael Faraday both demonstrated electricity and established the Institution's annual Christmas Lectures for young people; Sir John Lubbock lectured on the social behaviour of ants, bees and wasps; and Thomas Henry Huxley ("Darwin's Bulldog") on evolution. Michael Faraday lecturing at the Royal Institution in 1856 (image is in the Public Domain). Experimental science became not only the foundation of new technologies, but also a hobby for many people. It also posed some difficult questions, however, removing some of the certainties on which people had based their lives for centuries. If, as Charles Darwin and Alfred Russel Wallace claimed, life had evolved by means of "natural selection," was there any basis for a belief in God? If not, then the Bible could surely no longer be the basis of morality, but what was to replace it? The Metaphysical Society was founded in 1869 to ponder just such questions, bringing together such luminaries as Huxley (who coined the word "agnostic"); the politician, William Gladstone; the artist and critic, John Ruskin; the poet, Alfred Lord Tennyson; and the churchmen, Cardinal Manning and Arthur Penrhyn Stanley, the Dean of Westminster Abbey. 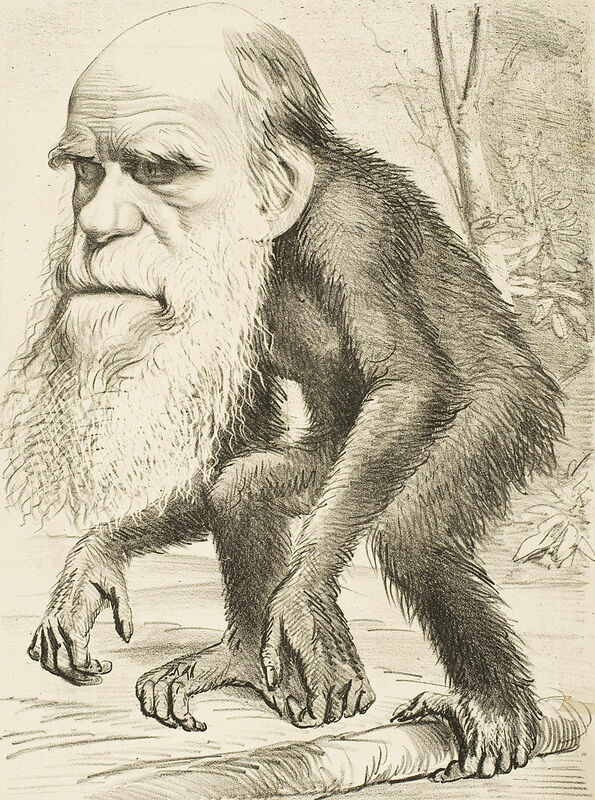 Cartoon of Charles Darwin, from The Hornet, 1871 (image is in the Public Domain). Similarly, if, as men such as Davy and Faraday had proven beyond doubt, we are constantly surrounded by powerful forces, such as magnetic fields and radio waves, of which we are unaware, but which can, with the right knowledge and equipment, be harnessed to human use, what else might be "out there" to be tapped? The spirits of the dead, perhaps, moving unseen amongst us, waiting to be "contacted"? Spiritualism, like science, became a hobby and, for some people, an obsession. Some mediums, such as Florence Cook in Hackney and the Fox sisters in America, even claimed to be able to "materialise" spirits, until their fraudulent practices were revealed and demonstrated in the 1870s by stage magicians such as John Nevil Maskelyne and George Alfred Cooke. The medium, Florence Cook, claimed to be able to materialise a spirit, "Katie King" (image is in the Public Domain). 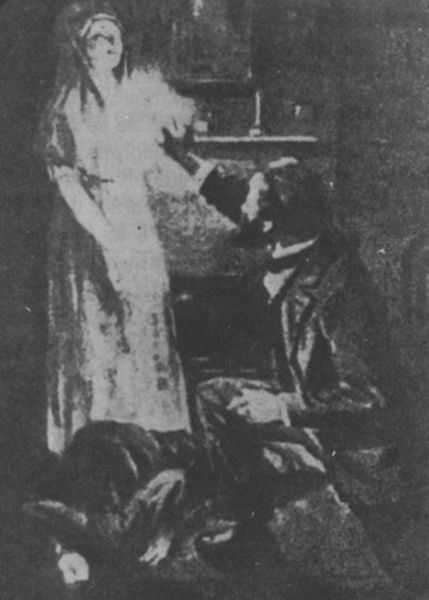 Here the chemist and physicist, Sir William Crookes, encounters her, and is convinced, but Cook was later unmasked as a fraud by George Sitwell (the father of the poet, Edith). A.S. Byatt's novel, Angels and Insects, is, in effect, two novellas bound together, exploring these issues through the eyes of both fictional and historical characters. 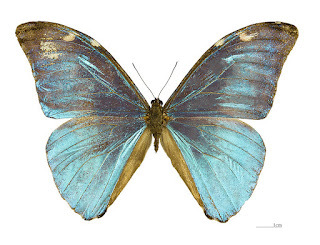 In the first novella, Morpho Eugenia, a fictional naturalist, William Adamson (who has much in common with Alfred Russel Wallace) returns to England from an Amazonian expedition. He is impoverished, but finds a patron in the Reverend Sir Harald Alabaster, who employs him to catalogue his collection of natural history specimens. Sir Harald agonises over the reconciliation of science and faith, and looks to William for reassurance, which he finds himself unable to provide. 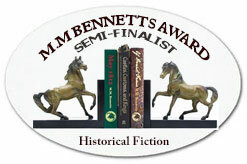 William falls in love with, and marries, Sir Harald's socially awkward daughter, Eugenia, and they start a family. Whilst William enjoys the uneasy confidence of Eugenia's father, he meets outright hostility from her brother Edgar, a hostility he assumes to be founded in snobbery, but which turns out to have much darker roots. Together with his children and their tutor, the mysterious and beguiling Miss Matty Crompton (a servant who quotes Milton & Ovid, and writes poetry and fiction of her own), William embarks on a study of ants' nests around Sir Harald's estate, but Matty is party to the family secrets, and it is very uncertain where her increasingly close association with William might lead. 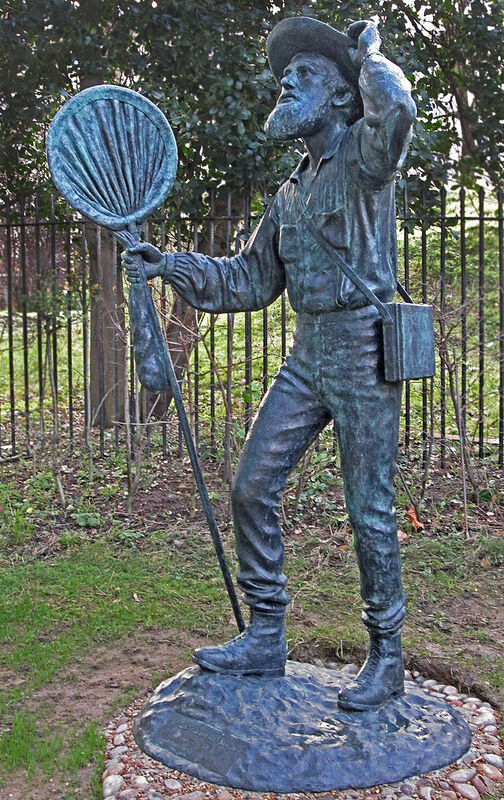 Statue of Alfred Russel Wallace (1823-1913), a zoologist mentioned in Byatt's text, but who also appears, at least in part, to be the model for William Adamson. 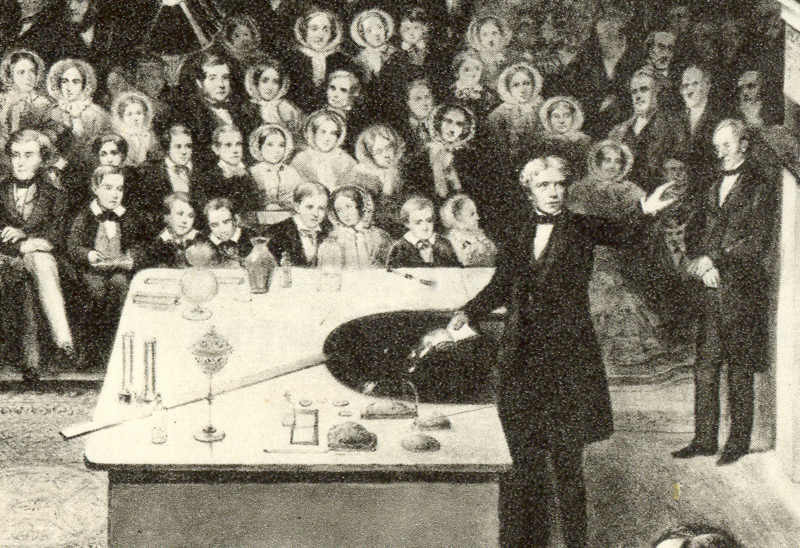 Wallace hit upon a theory of natural selection independently from Darwin, and a summary of both theories was presented simultaneously to the Royal Society with neither man actually present. Although the two theories are essentially similar, Darwin's reputation went on to eclipse Wallace's, in part because of his more influential social connections. 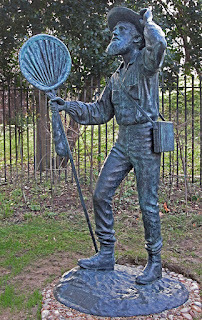 The statue, at the Natural History Museum, is by Anthony Smith. Photo: George Beccaloni (licensed under CCA). "'It is hard,' he said to William, 'not to agree with the Duke of Argyll that the extraordinary beauty of these creatures is in itself the evidence of the work of a Creator, a Creator who also made our human sensibility to beauty, to design, to delicate variation and brilliant colour ... The world has changed so much, William, in my lifetime. I am old enough to have believed in our first Parents in Paradise, as a little boy, to have believed in Satan hidden in the snake, and in the Archangel with the flaming sword, closing the gate. I am old enough to have believed without question in the Divine Birth on a cold night with the sky full of singing angels and the shepherds staring up in wonder, and the strange kings advancing across the sand on camels with gifts. And now I am presented with a world in which we are what we are because of the mutations of soft jelly and calceous bone matter through unimaginable millennia - a world in which angels and devils do not battle in the Heavens for virtue and vice, but in which we eat and are eaten and absorbed into other flesh and blood ...'"
Morpho eugenia, the Amazonian butterfly that gives its name to the first novella, Museum of Toulouse. Photo: Didier Descouens (licensed under CCA). In the second novella, The Conjugial Angel, we find ourselves in Margate, in the company of Mrs Lilias Papagay, the wife or widow of a sea-captain (missing, presumed drowned), and Miss Sophy Sheekhy, a spirit-medium. Their social circle includes Emily Jesse (a historical character - the sister of the poet, Tennyson, and the wife of a retired sea-captain, Richard); and a Mr Hawke (fictional, I think), described as a "theological connoisseur:"
"He had been a Ritualist, a Methodist, a Quaker, a Baptist, and had now come to rest, permanently or temporarily, in the Church of the New Jerusalem, which had come into being in the spiritual world in the year 1787 when the old order had passed away, and that Spiritual Columbus, Emanuel Swedenborg, had made his voyages through the various Heavens and Hells of the Universe, which he was shown in the form of a Divine Human, every spiritual and every material thing corresponding to some part of this infinite Grand Man." "When Mrs Papagay tried the automatic writing on her own for the first time, she received, she thought, indisputable messages from Arturo, then or now, alive or dead, tangled in seaweed or in her memory. Her respectable fingers wrote out imprecations in various languages she knew nothing of, and never sought to have translated, for she knew well enough approximately what they were, with their fs and cons and cuns. Arturo's little words of fury, Arturo's little words, also, of intense pleasure. She said, dreamily, 'O, are you dead or alive, Arturo?' and the reply was 'Naughty-lus tangle-shells sand sand break break breaker c.f.f.c. naughty Lilias, infin che'l mar fu sopra noi richiuso.' From which she concluded that on the whole he was probably drowned, not without struggle. So she put on mourning, took in two lodgers, tried her hand at a novel, and lived more and more in the passive writing." 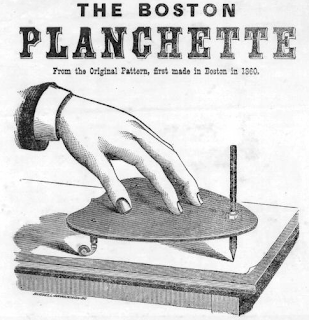 Advertisement for a "planchette" to facilitate automatic writing, as a method of communicating with the deceased (image is in the Public Domain). Manufacturers experimented with various materials as a means of "insulating" users from the influence of evil spirits, just as the makers of the first electrical devices sought to insulate their customers from electric shocks. A shipwreck, and the character of Mrs Papagay's husband, Arturo, create the link between the two novellas, as becomes clear at the junction between them. In both cases, Byatt's narration is interwoven, not only with the dialogues between her characters, but with the poetry, fiction and theology of the time itself. Historical fiction meets the history of ideas in a dazzling evocation of a moment in which everything seemed to be at stake, the fiery furnace in which modern Britain was forged. Nice review! What an interesting time the 19th century was! Thanks, Elizabeth! I've written non-fiction on some of these aspects of the 19th Century (a biography of Sir John Lubbock), and taught courses on Victorian London. 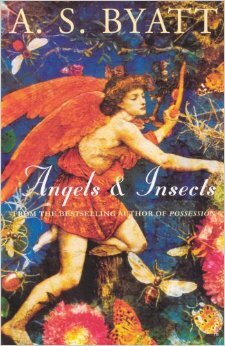 A.S. Byatt is not someone I bump into in the archives, but she certainly did her research for this.